I am writing this at a local cafe enjoying my latte and free wifi while C diligently chases endorphins in a gym nearby. How different we are in that respect. He is high as a kite after working out while I just end up feeling sticky and, pardon my French, pukey. Food for me is a whole world of tastes and textures and colors and smell and memories and experiences…while he, although no less adventurous in that department than I, tends to plunk them into boring categories like “carbs” and “fat” and “protein”. – Cook barley as per package instructions. Set aside. – Heat olive oil in a pan. Add onions and potatos and sautee for a couple of minutes. Add garlic, dried thyme, and fennel seeds. Toss. Add sausage and sautee until potatoes are soft, onions are slightly golden, and sausage is nice and seared in places. – Add cooked barley and toss so everything is evenly mixed. Season to taste with salt and pepper and sautee a bit more just to mingle flavors. Take of heat and serve. After this dish I will definitely be exploring more of barley! Soft with a nice bite to it, and a delightful nutty-ness, this grain is all set to be experimented on in my kitchen 🙂 Especially as both C and I enjoyed this so much! You must have noticed that I was totally sneaky by adding a bit of potato to this dish 🙂 I plead guilty! But I love the taste of the soft potato and sweet onions amidst all the yeilding crunch of barley…like a healthful hash. I’ve kept the potato at a minimum but you can do without it if you wish. I used country-style sausage made by the cousin of a friend of mine which she sells from her home (better than supermarket-bought by a mile!). This would be wonderful with fresh thyme but I only had dried…so please use fresh if you have it! 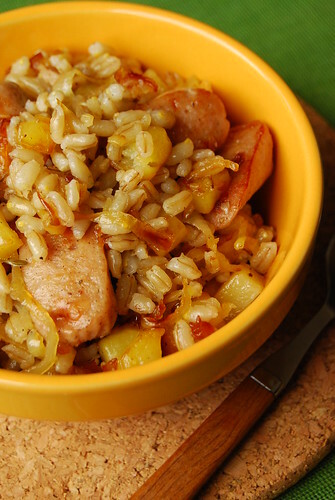 This makes for a very satisfying meal (barley is digested slowly, making you feel full longer) — the sauvory-ness of the sausage cushioned perfectly by the barley and potatoes, and the sweetness of the onions. Fennel and thyme get on famously with sausage I feel, which is why I’ve used them here. I think I’ll stir through some crumbled goat’s cheese at the last minute the next time I make this. Although I continue to look for healthy alternatives in eating, don’t think I’ve gone over to C‘s and my mom’s side of the fence. I certainly don’t see myself ever waxing poetic over “whey protein”. And I still have a few tricks up my sleeve…like the pasta sauces C loves (which of course will involve pasta!) and dishes C cannot eat without rice! 😉 Ssshhh!